News has a way of helping readers separate fact from fiction. But what happens when news is fiction? Some fake stories of 2016 reaffirmed people's biases: "FBI agent suspected in Hillary email leak found dead in apparent murder-suicide," while others were outright outrageous: "Woman Arrested For Defecating On Boss' Desk After Winning The Lottery." In a time of "alternative facts" consumers must be on the lookout. Some in Donald Trump’s inner circle have likened the new president to Andrew Jackson. A couple weeks ago, Trump even had a portrait of Jackson – America’s first populist leader – hung in the Oval Office as a source of inspiration. Whether Trump’s social and political leanings are anything like Old Hickory’s is a point of debate. But their paths to the White House do share an important feature: Both were accompanied by a resurgence of fake news. What’s behind the rise of ‘fake news’? The concept of “fake news” has evolved quickly. First it was false or misleading stories spread on social media in the run-up to the presidential election. There was a lot of talk about fake news swaying the election results, and while bogus news stories were shared widely, researchers at Stanford University and New York University concluded in January they didn’t have outsize influence on the election results. How did fake news get to such an important place in the body politic? It’s a perfect model for how to sell a false story. Exaggerate wildly. Manipulate statistics egregiously. Double down on lies. Apply grotesque, racist stereotypes. When people who know the facts tell you you’re wrong, accuse them of being part of a globalist conspiracy. Bonus points if you can get an alternative-universe lawmaker or two, like Idaho’s Heather Scott, to spread your tale. Judging by online comments, there’s a lot of confusion about the different parts of a news report – is it a story, an editorial, or a column? When people got their news exclusively from the printed newspaper it was much easier to differentiate. An editorial appeared on the Opinion page. A local news columnist’s work looked different from a regular news article, usually because it included the columnist’s photo. Those visual cues aren’t as apparent online. Our newspaper’s critics are split: Are we The Socialist-Review or are we The Spokesman-Republican? Fresh young reporters at The Spokesman-Review quickly learn that they have been pronouncing the name of their paper wrong. “It’s the Socialist-Review,” a neighbor will correct them, with a grin. The second thing that they’ll learn, possibly from neighbors on the opposite side of the street, is that their paper might as well be called The Spokesman-Republican, since it marches in lockstep with the GOP. In most cases, this tells you more about the political leanings of your neighbors than it does about the paper. 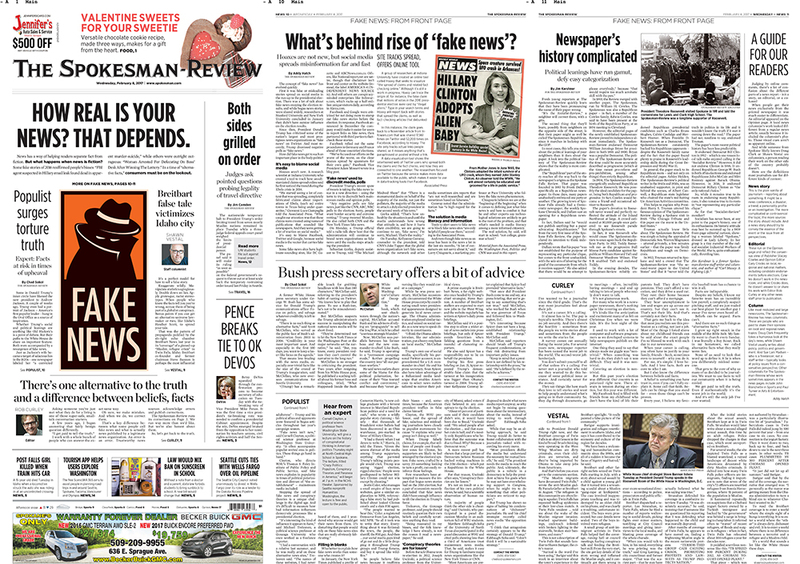 A look into the political history of The Spokesman-Review shows that the reality is more complicated.